Located in the prestigious Monte Lemos area this exclusive development of only 4 apartments offers serenity and relaxation in the sun. This ground floor apartment has a large modern open plan living/dining area with patio doors leading directly to the furnished south facing balcony and pool area,offering sea views while you brunch. The lounge and dining areas are very light and airy; the modern, well-equipped kitchen has granite worktops with breakfast bar, gas hob/electric oven, microwave, family-sized fridge/freezer, washing machine and dishwasher. There is one spacious double bedroom and one twin. (Luxury aerobed can be inflated in lounge area to accommodate up to 6 persons). There is separate access to the apartment and private parking. The large pool is shared by only three other apartments and is within mature private gardens. Sun loungers are provided by this apartment. We bought in Luz to provide our two young children with a safe environment to spend their early sand and swimming. The apartment is perfect in that we can put them to bed and relax on the patio, or in the lounge. Hotel holidays were not on the cards any more and we find this a perfect home from home where we can relax and get so much from returning to the familiarity of our own apartment and the surrounding area. The area is very relaxed and we feel very at home in Luz. We can get from Faro to Luz in an road access is very good and driving in Portugal is not stressful. Luz is the perfect hide away. Beautiful and relaxed in its own right with a wonderful beach and numerous good restaurants, but only a few km from Lagos which is a vibrant fully functioning portuguese town. The beaches along this stretch of coast are fantastic and the sea is so therapeutic. The apartment is can put the children to bed of an evening and relax on the patio or in the lounge. The ground floor apartment affords us easy access to the pool area, and we can happily sit on the patio and monitor the chldren in the pool, knowing that if we need to we can be in the water in 4-5 plus from the safety aspect. Also we don't have the hassle of heading back up a flight of stairs to get food and drinks to the sunbeds. We are only 10 metres from the fridge at any one time! Family bathroom with bath/shower over, and wc. Notes on accommodation: Accommodation is suitable for adults and children alike. The apartment has its own separate entrance, and private parking area. Cot is on site for children, and inflatable aerobed (Argo's best) if required for lounge area. Outside: The development is set within private mature gardens with a swimming pool, shared with only 3 other apartments. Loungers are available at the pool. The balcony is south facing and furnished with table and chairs and sun parasol. Cleaning / Towels / Linen / Maid service: Linen and bathroom towels are provided, and apartment is cleaned once a week. Additional cleans can be provided for a small cost if required. Other: There is a large six seater table in dining area. All rooms have been recently decorated and fitted with new curtains and bedlinen. Directions to the apartment were detailed and easy to follow.The apartment was comfortable, very clean, roomy and well equipped. It had distant views of the sea and was a 15 minute stroll to the beach and centre of Luz. We discovered several good restaurants in Luz, some of which were recommended by the owner. Most of all the weather was sublime which made our holiday so enjoyable. We highly recommend this property for rental purposes. Thanks for making the effort to post a review to help guide others in search of holiay accommodation, and we are delighted you had such a good time. Tom & Pat. The picturesque old town of Lagos with its narrow cobbled streets and marina is only a 5 minute drive away. 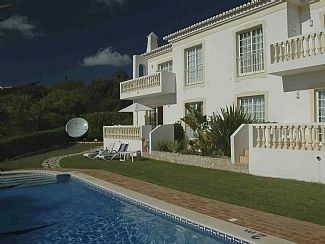 Luz is approximately 50 minutes drive from Faro Airport along the A22 Motorway. A car is not necessary to get around Luz as everything is within walking distance. Airport transfers are available at an additional cost. Nearest airport: Faro at 56 miles. Nearest airport is Faro at 100km. Nearest motorway is the A22 at 9km. Nearest ferry port is Santander at 1,200km. Nearest train station is Lagos at 6km. I email complete directions from Faro Airport prior to your travel if required. The apartment is situated in the exclusive Monte Lemos residential area, less than 10 minutes easy walk from the village centre. A car is recommended to tour the area, however is not required to get around Luz. Taxis are available locally. There is an information pack within the apartment with places of interest and details of where to eat etc. Airport transfers and welcome packs are available on request. I email full directions to supermarkets etc, prior to travel should you be arriving late and want to shop on your journey.